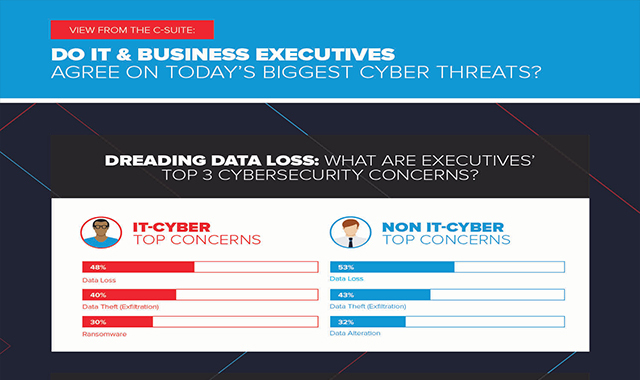 Do Executives and Cybersecurity Pros Agree on Today’s Biggest Cyber Threats? #infographics ~ Visualistan '+g+"
Breaches cost companies billions, erode trust and can have a long-lasting negative impact on a company’s brand. With so much as stake, we wondered: are C-Suite executives aligned with their security and IT pros when it comes to cybersecurity? We asked 345 C-Suite executives and cybersecurity/IT pros in the U.S., U.K., France and Germany some questions to find out. Corporate executives share the same concerns as their security teams. When asked to name the top three cybersecurity concerns facing their organizations, both groups cited data loss and data theft/exfiltration as their top two concerns. However, the two groups differed when naming their third main concern. The cybersecurity/IT pros focused on ransomware like 2017’s WannaCry, which cost organizations an estimated $4 billion in total damages in its wake. The C-Suite group was concerned with risks stemming from data alteration – an act of sabotage by changing critical information, such as code for an automated assembly line.